In the summer of 1970 legendary but self-destructive director Orson Welles returned to Hollywood from years of self-imposed exile in Europe and decided it was time to make a comeback movie. Coincidentally it was the story of a legendary self-destructive director who returns to Hollywood from years of self-imposed exile in Europe. Welles swore it wasn't autobiographical. 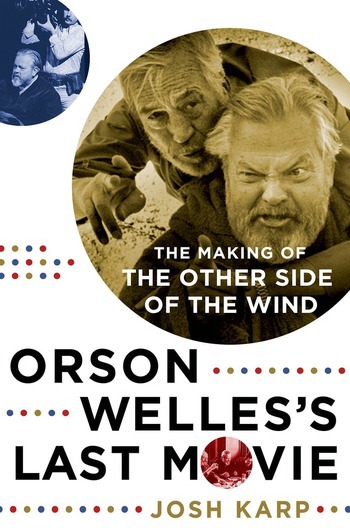 The Other Side of the Wind was supposed to take place during a single day, and Welles planned to shoot it in eight weeks. It took twelve years and remains unreleased and largely unseen. Orson Welles's Last Movie, by Josh Karp is a fast-paced, behind-the-scenes account of the bizarre, hilarious and remarkable making of what has been called "the greatest home movie that no one has ever seen." Funded by the Shah of Iran's brother-in-law, and based on a script that Welles rewrote every night for years, a final attempt to one-up his own best-work. It's almost impossible to tell if art is imitating life or vice versa in the film. It's a production best encompassed by its star, John Huston, who described the making of the film as "an adventure shared by desperate men that finally came to nothing." He was disappointed in the world. So he built one of his own. JOSH KARP is the author of Orson Welles's Last Movie, a journalist, and a writer who teaches at Northwestern University. His first book, A Futile and Stupid Gesture: How Doug Kenney and National Lampoon Changed Comedy Forever, won best biography of 2006 at both the Independent Publisher Book Awards and the Midwest Book Awards. Karp is also the author of Straight Down the Middle: Shivas Irons, Bagger Vance and How I Learned to Stop Worrying and Love My Golf Swing. His writing has appeared in Salon, The Atlantic, and Newsweek among others.